Seeing as I'm still mourning being back in the UK and not sunning myself poolside I thought today I would write about holiday makeup! 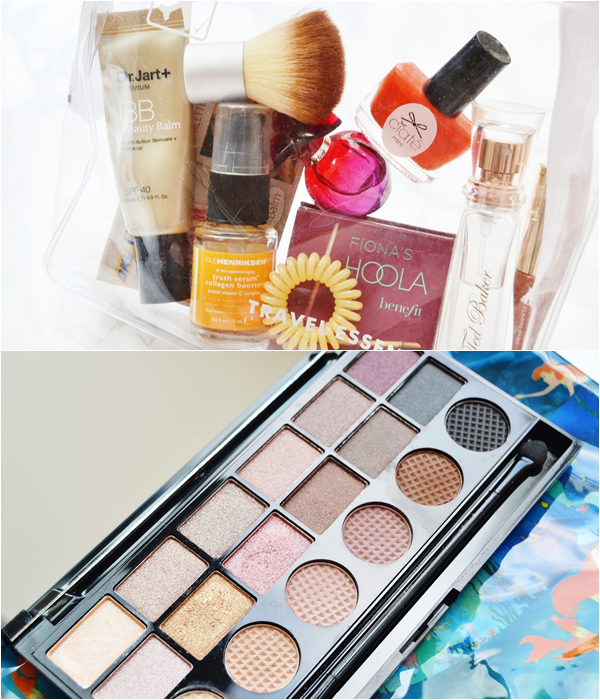 Well more travel friendly makeup and how to pack efficiently. Unlike past years I decided to pack light for my recent holiday and only take cabin luggage with me with the maximum weight of 10kg and with of course liquid restrictions. In the past I've been a bit blurry on how many liquids I could take so I looked it up and as long as it's in the correct sized clear bag (I bought this one off eBay for 99p) you are allowed upto 1 litre of liquids (quite a lot!) in bottles no bigger than 100ml each. So with a quick overview of the makeup I planned on taking I knew I'd be fine! I did however pack lighter on the makeup front due to taking a few 100ml bottles with me however this made me take only the makeup I knew I'd use and resulted in me spending less time applying makeup and going makeup-free during the day. In some ways picking skincare to take on holiday is pretty easy as a lot of products now have travel friendly sizes and if you are subscribed to any monthly beauty box you will have a stack of samples you can try out whilst on holiday. Plus if you think in advance you can collect free sachets from magazines to use whilst on holiday. I did just that with my last holiday, taking 3 sachets of moisturiser to try out, a mini REN Micellar Cleansing Water (didn't love it tbh! ), my trusty Ole Henriksen Truth Serum and a bar of Dead Sea Spa Magik Black Mud Soap that can be used on the both the face and body. I was tempted to take more but I decided to keep it minimal as the sun does do wonders to the skin and proper cleansing and keeping the skin hydrated is the only thing that's needed! 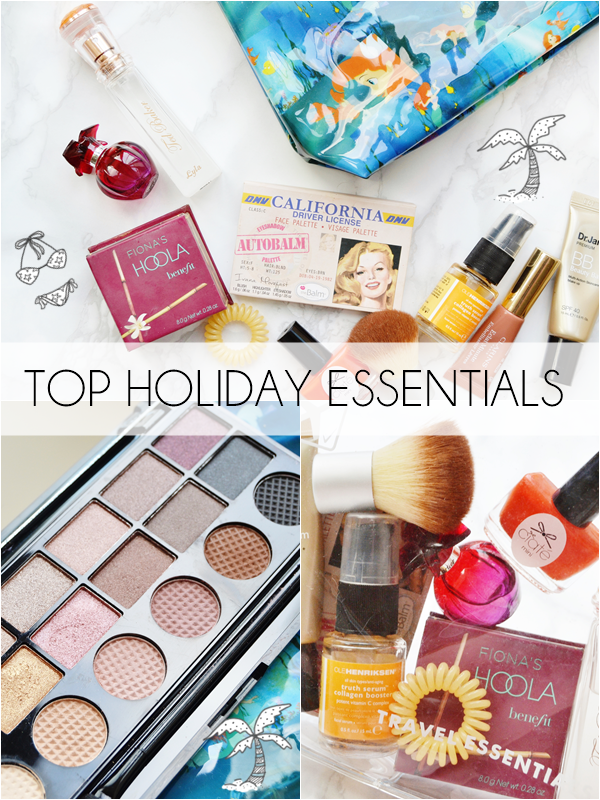 If you're a makeup lover packing a compact makeup bag can easily be the most stressful part of holiday prep. Whittling down your makeup to select items isn't easy but definitely achievable, especially if you realise what you do and don't need. For me I decided to ditch primer, highlighter and to opt for multi purpose products such as brown eyeshadow for filling in my brows and using under the eyes and in the crease. My biggest tip would be to take an all-in-one palette with staple colours such as the above theBalm palette and sachet samples to try out. Rundown of my own holiday makeup bag - Dr Jart Beauty Balm, Essence Concealer, theBalm Autobalm Palette, Benefit Hoola Bronzer, Clarins Mini Instant Light Natural Lip Perfector - Rosewood Shimmer, Models Own Lip Stix in Beauty Blush, Benefit Roller Lash Mascara Mini and L'Oreal Super Liner Perfect Slim. I also picked up a Makeup Revolution 'What You Waiting For?' Palette (£6.00 - Superdrug here) whilst on holiday! Side note - TOTAL love. Extra Tip: If you are taking sachets with you, whether it be foundation, moisturisers or primer samples, instead of ripping off the top then wondering how you are going to store it without it leaking, simply prick the middle of the sachet with either a pin or the end of a hair grip (with the rubber tip removed of course). Then you can squeeze out exactly how much you need each time! For my hair I kept it simple with a travel size shampoo and conditioner (50/60ml is just enough for a 2-week holiday) and a hair oil that could be used on both wet and dry hair - essential if you are going to be swimming in a pool or the sea. For my last holiday I took a OGX Macadamia Oil shampoo mini (from Tesco or Waitrose) as I love the brand and most shampoos from the brand are SLS-free and a Aussie 3 Minute Deep Conditioner, again because I love Aussie as a brand and because I can't get enough of the bubblegum scent! I also decided to take a sachet of L'Oreal Extraordinary Hair Oil (free in a random magazine) instead of risking a bottle leaking over everything, which actually worked out really well and lasted around 10 days. Packing SPF is a must! Of course you could buy it on holiday but from experience you don't want to risk buying outdated suncream which will give a lower SPF (this can happen if you go to a small resort) and it will most likely cost you more. Easily my favourite easy-to-apply suncream, well oil is Calyspo SPF30-50 Sun Protection Oil, it's the best non-sticky spray oil I've used. As I only travelled with cabin luggage I was restricted on liquids but I simply decanted the 200ml bottle into two 100ml spray bottles which I purchased in travel bottle set from Poundland. Another essential is deodorant, a mini will do just fine and can be picked up from any supermarket. The one product I don't pack however is moisturiser as I always like to slather it on and be quite liberal with it, so I always buy a big tub of moisturiser/after sun lotion whilst on holiday. For me extras are perfume, nail polish, hair ties and makeup brushes. 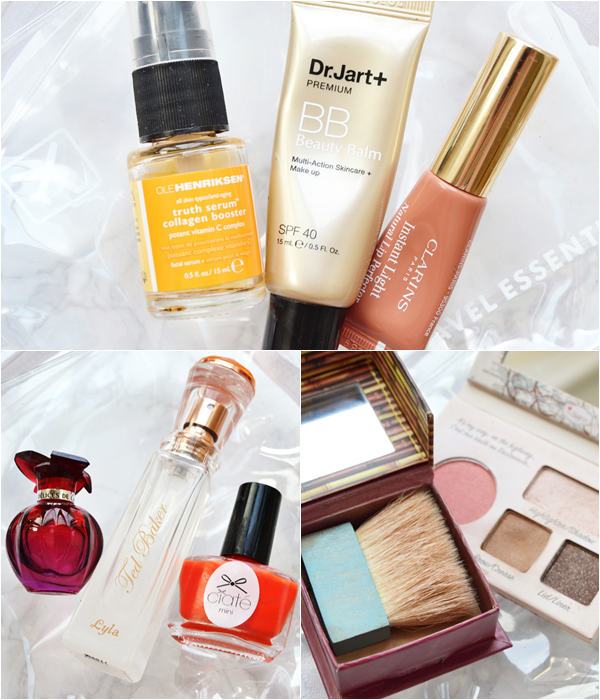 General extras that seem to bulk up your makeup bag but are very much needed. Starting with perfume as it's pretty much a holiday staple for most, I like to take away a few choices, this year I went for Ted Baker Lyla perfume as it's the perfect size and so sweet smelling, a Cartier mini and a Travelo style atomiser filled with Vera Wang Princess in it. Travelo can be picked up from fragrance shops and Amazon but the much cheaper £1.65 version I decided to buy off eBay here did the exact same job! As for nail polish, again travel/minis are a must. I seem to have a ton of Ciate minis so I went for a vivid orange shade but OPI also offer mini sets as well as Essie offering mini trio sets online and in Boots stores. Hopefully this has been helpful to all the over-packers out there! If you are going on holiday this year - Stay strong, I know you've got this!